When winter gets tough, Troy-Bilt gets tougher. The Vortex 3090 XP three-stage snow thrower gives you a whole new level of snow-busting muscle. 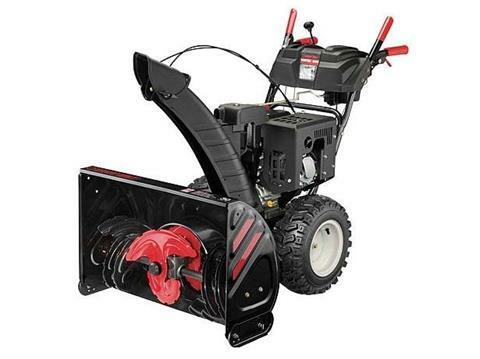 Equipped with a powerful 420 cc Troy-Bilt engine, large 16 inch X-Trac™ tires and the new 12 inch accelerator that makes the three-stage process of snow removal possible. The three stage snow thrower's accelerator spins 10 times faster than the Xtreme™ augers, breaking down the heaviest, wettest snow like it was fresh powder. Just One Touch™ electric 4-way chute control allows you to control the chute's pitch and rotation with the tip of a finger, allowing you to adjust the direction of snow discharge without having to move a hand. Other features on the Vortex XP three-stage snow thrower include Touch 'n Turn® power steering, Just One Hand® operation, deluxe reversible skid shoes and heated hand grips.